I got a brand new soldering station from my father in-law as a christmas/birthday present and I must say that good tools definitely make a big difference; soldering the pcb was a breeze! The Cupcake pcb is done! Well, almost.. I made a mistake and ordered a 10mm trimpot and it just doesn't fit the board. So make sure that you order a 5mm trimpot! 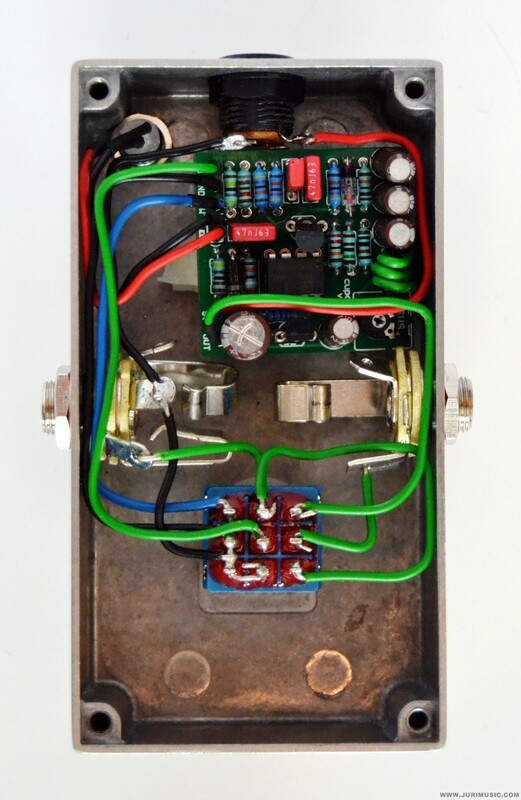 The layout is really simple; a footswitch, one indicator led and one knob. I had already printed the older version of the layout and felt that the bypass-switch was located too low. So I did some final adjustment with scissors and tape to make the layout match my EHX Freeze-pedal. I also decided to add the LED to upper right corner of the pedal to achive some nice asymmetrical vintage-vibe! Drilling is easy when you have a good drill bit(s). I recomend using a step drill bit, since it makes the work a lot easier. But first I used a hammer and a i-don't-know-what-that-tool-is-called -tool to lightly 'punch in' the holes; this ensures that the drill bit doesn't slip. I wanted the appearance to be simple and minimalistic. No labels, no paint.. just smooth and shiny aluminium. I thought that this kind of finish would be easier to do than painting, but I was dead wrong. I took me hours of sanding by hand and I will never do that again without better tools! Anyway, I still feel that it was worth it. The enclosure looks really nice! Buy some sandpaper that is suitable for wet sanding and some metal polish. Use a sanding block to make sure that the surfaces stay as flat as possible during the sanding. Work your way up from coarse to fine. I started with a 240 grit sandpaper and went up to 1200. (240, 400, 600 and 1200). Use plenty of water and be patient; make sure that the surface is smooth before moving to higher grit sandpaper. Finalize the enclosure with metal polish. After the 1200 grit sandpaper I used metal polish to get the final shine out. The shine don't come easy and I polished the enclosures around 8-10 times. Use small amount of metal polish, a soft rag (old t-shirts are good) and work with small circular motions. Protect the aluminium from oxidizing and loosing that shine. Probably the best way to protect aluminium from oxidizing is to use some sort of protective wax (carwax etc.). Another option is to spray the enclosure lightly with clearcoat. I'm still pondering between different options.. Putting everything together and wiring the effect was a painstaking process. The layout developed some problems and it took some time to get the pedal ready! I used solid core wire and aimed for a neat and professional looking wiring. Of course I had to make one beginner mistake: I installed the Q2 transistor reversed and that burned up the bias-trimpot.. I posted a question to madbeanpedals.com forum and one member was kind enough to point me at the right direction with my debugging. I replaced the trimpot and installed the transitor correctly and the Cupcake was ready to rock! "I was perusing through a pile of old Japanese schematics instead of working like I should be, and noticed something called an "Orange Clash". On closer inspection it was very clearly a note-for-note/part-for-part clone of an Orange Squeezer. Although the accompanying text is in Japanese (which is Greek to me! ), the schematic shows an arrow pointing to the place where the trimpot, 24k resistor, 4u7 cap and gate of the secondary FET are tied to the source of the principle FET. The schematic indicates that, with a 9v supply, this trimpot should be adjusted to read between +1.5 and +1.7 vdc. Obviously you can take that reading at any of the aforementioned components where your probe conveniently fits." Note: I assume that the 24k resistor mentioned is a typo and it should be 2k4 (R5). "It seems like some people think that the entire range of the trimpot that allows sound to pass applies compression, which it does not. The trimpot, when properly set, has the narrowest of narrow ranges where compression is actually present. Set it too low and you get no sound. Set it even a fraction too high and you have a booster, not a compressor. You have to set it right in the middle of the crunchy static that occurs in the transition between no sound and full sound. I have verified this using a signal generator and looking at the resulting gain reduction in Audition." "As for adjusting the OS, at one end you will get a lot of volume and maybe distortion, and as you turn the pot the signal will fade to zero. The ideal setting is a matter of taste, but the closer you are to the point where the signal starts to cut out is where you are getting the most compression. At the other extreme you are essentially just getting a boost." The noise floor raises quite rapidly when the trimpot is set above 1.40 vdc. The values mentioned above (1.50-1.70 vdc) seemed pretty high and at those settings the pedal is acting more like a booster to my ears. Also on the higher trimpot settings (around 1.50 vdc) the compressor 'pumps' quite a bit and I didn't like the sound at all. So after careful tweaking and testing I decided to set the trimmer to 1.38 vdc. Notice that I fine-tuned the pedal for my Epiphone 335 with humbucker pickups. I have never played with OS compressor before and don't know what to expect, so I still have to try out different settings and also try it with my 80's Squier Strat. Here's a quick demo! Just a nice little theme I wrote years ago.. Thanks for the info regarding the trim pot. I just built one of these and couldn't figure out why it was sounding like a dirty booster. I dialed it in and now it sounds like a compressor pedal! Nice to hear that my article was helpful and you got your Squeezer working! Lovely work! Was just about to build another point to point version of the OS. Wasn't completely thrilled with my first but may revisit it what with the Trimpot info you've provided. Also, found out on Beavis that a set of matched 5457's are required. Live and learn. Thank you.